CGPSC State Services Competitive Examination. 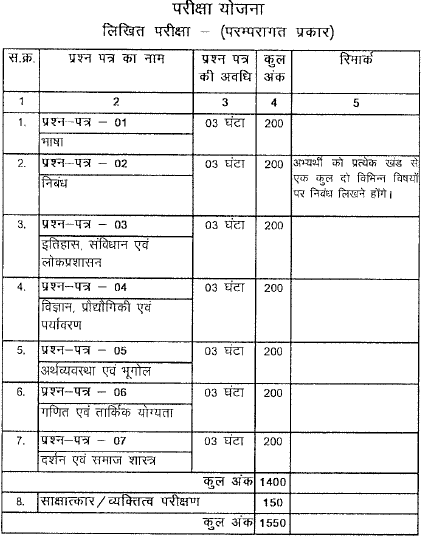 There are total 51 Naib Tehsildar vacancies available in this CGPSC recruitment. Last date apply online to attend the CG PSC SSE Exam 2017 is 07/January/2018. Preliminary Exam date is 18-02-2018. Candidates have to apply through official website of Chhattisgarh. @www.PSC.cg.gov.in. This Naib Tehsildars recruitment of CGPSC will be conducted in three different stages of Preliminary Exam, Mains examination and Interview. For more details regarding Revenue and Disaster Department Civil Services Naib Tahsildar vacancies age limits, State Services Exam see the below given details. The candidates must have qualified any Bachelors Degree from a recognized university. The candidate's age limits for General candidate is 21-40 years. For all other category candidates including Female General upper age limit is 45 years. Selection for this CGPSC Naib Tehsildar recruitment will be held based on common competitive objective type exams of prelims and mains followed by personal interview. Those who clear the both prelims and Mains exams they are only eligible for the personal interview based on merit in written test. Preliminary Exam will be conducted for 400 marks consists of 2 different papers and each paper contains 100 questions and each question carries 2 marks. Candidates belongs to Chhattisgarh State SC/ST/BC Non Creamy layer Rs.300/- and for all other Rs.400/- to be paid. Interested candidates can apply online @psc.cg.gov.in on or before the closing date of 07-January-2018. Upload the photo image and signature image copies as per given sizes. 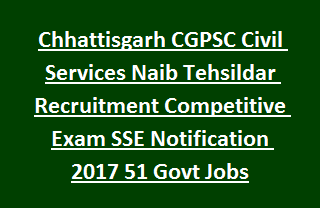 Click here to apply online for the CHHATTISGARH PSC Naib Tehsildar Recruitment SSE Exam 2017. 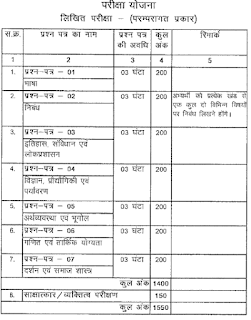 Download official notification here for Naib Tehsildar Vacancies in CG Revenue and Disaster Department. Please share this CHHATTISGARH PSC Naib Tehsildar Civil Services Recruitment Examination 2017 article and help others.